Summertime is calling my friends! With only a few weeks until the official start of summer, I think some of us have already gotten a taste of what’s coming in the next few months… and I’m not talking about the temperature. Yes, sunburn, the second downfall of the spring and summer seasons (the first would be bugs, of course). If you are a very pale individual such as myself and are susceptible to the dreaded lobster skin after a day out in the sun, be sure to load up on that sunscreen to avoid the pain and peeling of burnt skin. Of course, being me, I often forget to put sunscreen on certain parts of my body, or just in general, and end up with some bad burns each year. And you can bet I always get at least one red nose during the season (I’m already up to two… my bad). While sunburn is painful no matter where you get it on your body, I believe there are a a few particular spots that you really want to avoid getting sunburn on… three to be exact. I have gotten burnt on these parts before and let me tell you, these are terrible spots to have sunburn! Scalp // Even if you have a full head of hair, be very careful being out in the sun all day without a hat. Since it’s impossible to get sunscreen on your scalp with hair, you can bet you’ll get a sunburn somewhere where your hair parts without protection. I currently have a burn there and the pain when washing and drying my hair is intense. So remember to wear those hats people! Ears // It might not seem that bad to get sunburn on your ears, but you’ll regret forgetting to get sunscreen on them when you have a sudden itch and you scratch your unnaturally red ear. Thankfully my hair usually protects my ears, but during those extra hot days when my hair is in a ponytail, my ears get the burn. Luckily, I remembered to slap some sunscreen on them the other day when I was out. Back of the Knees // Weird spot, I know. However, I have gotten sunburn on the backs of my knees multiple times and I can’t think of a worse spot other than the scalp than the knees. This happened to me this year after being out in the sun on my birthday and the next few days were terribly painful for me. Every single movement of the knees hurt, especially when it comes to climbing stairs. Please, don’t be like me and neglect the backs of your knees when putting on the sunscreen! 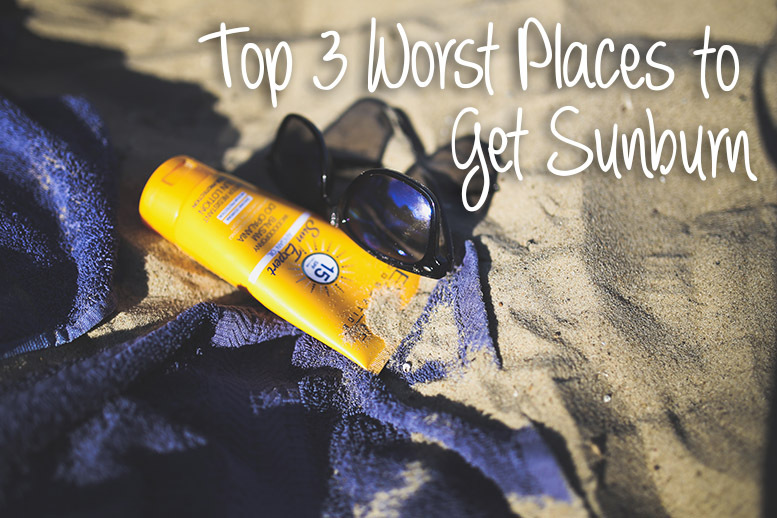 Where are the worst places you’ve gotten sunburn? See, I came into this post fully expecting some of these items to be “on a cruise” or “right before a wedding”, not literal places on the body. I had a bit of a chuckle at myself when I realized that wasn’t the case. Yeah, I can see how it can be taken that way now that I look at the title again.